Whenever there is a database issue, all eyes are on the DBA. Whether the issue has been caused by rain or due to some developer writing nasty code resulting in database slowness, the DBA is always expected to fix the mess. And you can imagine the kind of pressure you need to deal with if you are asked to quickly restore a database using the last available backup which, as you find out in the process, is not valid and the database integrity was already compromised a few months ago. Here lies the difference between a proactive DBA and a reactive DBA. In reality, your recovery strategy is much more critical compared to the backup strategy. What purpose can daily database backups serve if they are of no use at the time of restoration? With the unprecedented growth of database technologies and with new features appearing with every release, it is imperative for you as a DBA to stay ahead of the rest and make sure that you are following industry-best practices in database maintenance. Runs DBCC CHECKTABLE on every table and view in the database – this the integrity of all the pages and structures that make up the table or indexed view. Runs DBCC CHECKCATALOG on the database – this checks for catalog consistency within the specified database. Validates link-level consistency between table metadata and file system directories/files when storing varbinary(max) data in the file system using FILESTREAM. Validates the Service Broker data in the database. When you run the DBCC CheckDB command explicitly or through a job, it basically does all of the above. You can run the DBCC CheckDB command directly on a database and check for the results. Check the command’s output as shown on the screenshot below. The output shows the details about rows in the tables and the number of pages used by these rows. As this output shows, DBCC CheckDB is not supported with memory-optimized tables. Memory-optimized tables were first introduced in SQL Server 2014 as an Enterprise-only feature. However, over the years they have become a popular and wide-spread functionality in SQL Server. You will also notice that DBCC Check validated the service broker data in the database as shown below. What happens if errors are reported after running DBCC CheckDB? In the above example, you could see that DBCC CheckDB was completed without any errors. However, if you aren’t so lucky, you may come across consistency errors – and that will be the time when you need to make some critical decisions. If you came across issues on a production database it is best to inform the business owners or your Operations Manager to lay your cards on the table. You can either give them the option of restoring the database from the last available backup or you can experiment with running DBCC CheckDB commands with additional options. Table error: Object ID 36, index ID 1, partition ID, alloc unit ID (type In-row data). Keys out of order on page (1:107), slots 6 and 9. CHECKDB found 0 allocation errors and 1 consistency errors in table 'sys.syk' (object ID 36). CHECKDB found 0 allocation errors and 1 consistency errors in database 'VLDB'. repair_rebuild is the minimum repair level for the errors found by DBCC CHECKDB (VLDB). Table error: Object ID 36, index ID 1, partition ID, alloc unit ID (type In-row data). Keys out of order on page (1:107), slots 6 and 9. CHECKDB found 0 allocation errors and 1 consistency errors in table 'sys.syk' (object ID 36). CHECKDB found 0 allocation errors and 1 consistency errors in database 'VLDB'. repair_rebuild is the minimum repair level for the errors found by DBCC CHECKDB (VLDB). In the error message, you can see a carefully worded error message – “repair_rebuild is the minimum repair level for the errors found by DBCC CHECKDB” – suggesting you to run DBCC CheckDB with the repair_rebuild option. Just look at the word being highlighted – ‘minimum’. 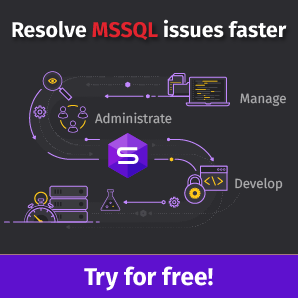 This means that, with the repair_rebuild option, there is no real possibility of data loss and SQL Server does some quick fixes under the hood. Please refer to the command below to run DBCC CheckDB with the repair_rebuild option. Make sure to place the database into single user mode. How critical is the database in question? Is the database on the production or a test environment? How big is the database? Do you have a good recovery strategy in case issues appear? Have you validated your database backups? Based on the situation and answers to above questions, try to make a decision keeping the client’s best interests in mind. Well, you don’t have to run all of these commands manually on your servers. That’s why we have maintenance plans in place. Make sure to schedule a regular maintenance cycle for all of your databases using the database maintenance plans. It’s a rather simple and straight-forward task. 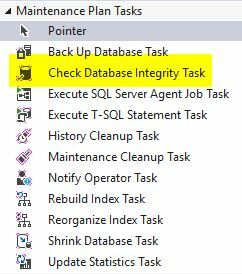 Under the “Maintenance Plan Tasks”, select the “Check Database Integrity Task”. This will add a sub-task to your maintenance plan to schedule integrity checks for your databases. Make sure to select the required databases as shown. Please be sure to run all database checks during an off-peak time of the week. Usually, the maintenance windows are on the weekends when the server is less busy compared to the other days of the week. However, this will vary from server to server and depends on the application. On critical database systems, alerts are generally shown whenever there are missed DBCC CheckDB or integrity checks. This way, the DBAs can proactively check and ensure they get the integrity checks completed to avoid surprises later on. SQL Server maintenance plans don’t need to be used all the time for performing maintenance tasks on your SQL Server instance. There are other available customized scripts you can use. One of the popular free maintenance tools is Ola Hallengren’s maintenance solution. You can install the whole maintenance solution which includes tasks for backups, optimization etc., or you can download only the relevant scripts related to integrity checks. 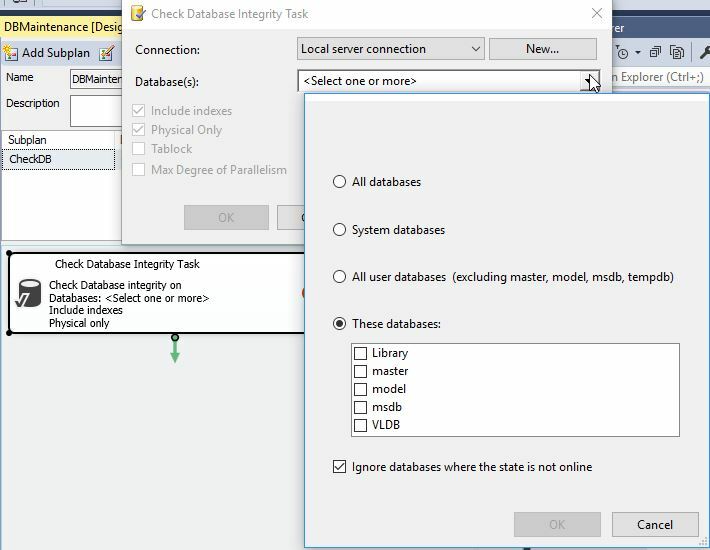 In this demo, we will try to install the scripts specific to database integrity checks. As the error states, you can download the missing code here. Once this is done, you can start trying out the database integrity checks. You can adjust various options using the additional DBCC command parameters. You can find more details and examples of those here. However, in this demo, we will check a few examples to see how easy and user-friendly these scripts really are. You can see the command that was run and theoutcome status which confirms that DBCC CheckDB completed successfully. On the screenshot, you can see that the DBCC CheckDB was completed successfully for the system databases. In the above example, you saw a few way we can use parameters. However, there are a number of other filters you can select based on your preferences. Also, as already mentioned, you can refer to this link for further understanding of Ola Hallengren’s scripts. 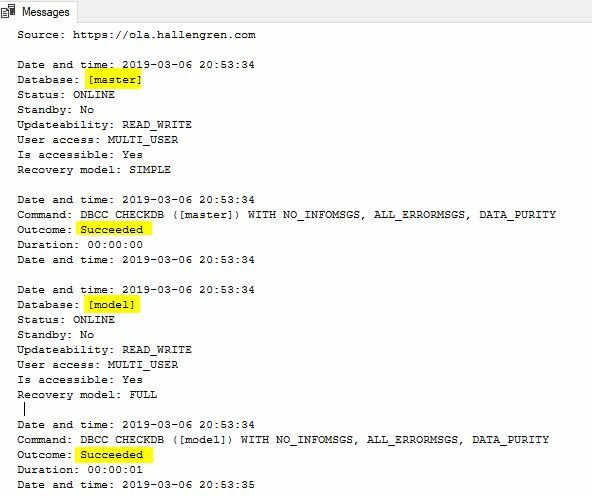 Just to reiterate, I am using Ola Hallengren’s scripts on the servers I manage and it is highly recommended and recognized within the SQL Server community. You can schedule the stored procedures based on your preferred parameters and run it is a SQL job during off-peak hours. This way, you don’t really need to run any of these scripts manually, so you can focus on other important tasks. Mohammed Moinudheen is working as a Database Engineer in a leading IT company in New Zealand. He has been working on SQL Server mainly as a Database Administrator (DBA) since 2005. He is interested in trying out new SQL features and also gets more exposure to cloud services, especially to Azure. He has regularly contributed to SQL Server websites on various topics.